Out in the last level were Jeff Lennon and Sean Drake. Here are chipcounts for some of the players in Day 1C of the $200,000 Guaranteed Ante Up World Championships Event 6, a $425 buyin. The 49 players remaining in Day 1C have headed off on a 10-minute break, we'll have updated chipcounts for some of those players in a few minutes. Day 1B is a wrap, and 62 now remain in Day 1C, playing down to 18 before bag-n-tag time. The Day 1C players are at blinds of 500/1000 with 100 antes. Here are the 22 players from Day 1B who have advanced to Sunday's Day 2 in the $200,000 guaranteed $425 Event 6 of the Ante Up World Championship Series. The QQ of @Mike_Postle bettered the AQ of Dana @shaynamouse Muse, ending Dana's night in 23rd place for a $700 cash. Postle and the 21 other Day 1B players are also done for the night, bag-n-tagging and coming back 11am Sunday for Day 2. 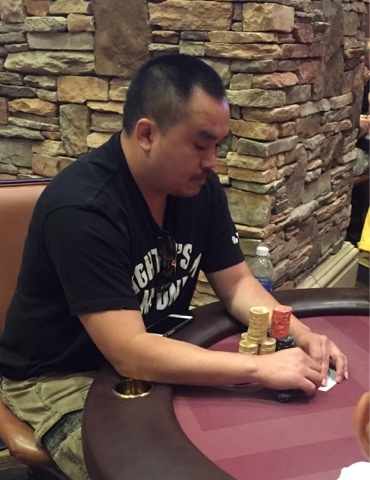 San Saelee was the first player tonight to 200,000 chops in Day 1B, but he is out 2 places away from bagging for the night, cashing in 24th place for $700. Dinner Break is over for the 81 player's remaining in Day 1C, play resuming with blinds of 400/800 and 100 antes. Here are the players who finished 23rd-26th today in Event 6, the $425 with a $200,000 guarantee in the Ante Up World Championship Series. Each player earned $700 but does not advance to Sunday's Day 2. Defending champ Kathy Stahl has been eliminated in 26th place in Day 1B, and says she is not coming back to play Day 1D tomorrow, so there shall be a new $200k GTD Champion. 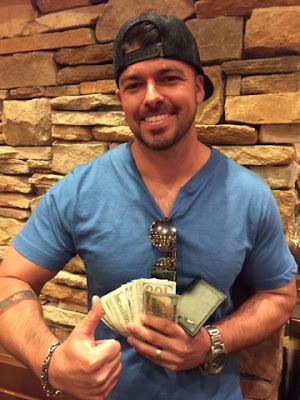 Stahl won this event last January, defeating a 929-entry field for a $62,000 first-place cash. One table was still playing as we hit 27 players ... and a player busted before the table broke so there is NO hand-for-hand as there's now 26 players ... everyone in Day 1B is in the money. 27 players remain in Day 1B, that means we are on the money bubble amd going to hand-for-hand play once the tables balance. Players finishing 23rd-26th earn $700. The remaining 22 players bag-n-tag to come back Sunday for Day2. Here are updated chipcounts for some of the 81 players remaining in Day 1C of the $200,000 guaranteed $425. The players have headed off on a 45-minute dinner break. The 81 remaining players in Day 1C have headed off on their 45-minute dinner break. We'll have updated chipcounts for some of those players in about 10 minutes. Blinds are up to 2000/4000 with a 500 ante for the 32 remaining players in Day 1B, stopping for the night at 22 players. We are down to 99 players in Day 1C, 45 minutes until the players get their 45-minute dinner break (and the LiveUpdate team gets its dinner break too). Among the players we see still in - from our eye-in-the-shy vantage point - is Joe Nguyen, Jeff Lennon, Duke Agbigay, Craig Gold, Brett Murray, Marty Gorenc, Gina Stagnitto, Roger Bailey, Nick Gorman, Mike Riddle, Bruce Angeski, Mike Husa, Brian Mintz and Ricky Lay. Here are some of the chipcounts from the players in Day 1B, entering Level 15, 40-minute levels now when they come back from break, and 42 players remaining. San Saelee (above) is just about to top the 200,000-chip mark, the biggest stack in the room with 47 players remaining in Day 1B. Marcos Stokes (below, with Nick Truax on his right) is close behind with 183,000 chips. Down to 58 players in Day 1B, blinds at 1000/2000 with a 300 ante in Level 13. Among the crew who arrived right as registration ended for Day 1C are Joe Nguyen and Mike Riddle. Registration has ended for the third starting flight in the $200,000 guarantee $425 buyin and the board shows a total 162 entries, making for an overall field size of 561 after 3 flights. Play continues tonight until there are 18 players remaining. Those 18 are going to bag-n-tag, coming back at 11am Sunday for Day 2. Players finishing in 19th-22nd place cash for $700 but do not advance to Sunday. The 74 remaining players in Day 1B are back at their tables after their 45-minute dinner break, returning to blinds of 800/1600 and a 200 ante. Play continues tonight until there are 22 players remaining. Those 22 bag-n-tag, coming back at 11am Sunday to join the 18 who already advanced from Day 1A, and those coming along from days 1C and 1D. Players finishing tonight in 23rd-26th place cash for $700 but do not advance to Sunday. There is a $100, 1-in-5-earn-a-seat multi-table satellite at 8pm tonight to win your way into the $425 with a $200,000 guarantee. Win a seat and play tomorrow at 11am in Day 1D of the $200k GTD tournament where there's a chance the total field size is going to hit 1,000 entries. Start with 6,000 chips in the satellite and play 15-minute levels. Late registration is open until 930pm. Level 3 late arrivals in Day 1C of Event 6 include Ricky Lay, Nick Gorman, Roger Bailey, Tim Klemin, Bruce Angeski and Evelyn Iraheta. We are approaching the end of Level 3 in Day 1C of the $200,000 guarantee, and the board shows 133 total entries, with more than 45 minutes left in late registration. This brings the total event field size now to 532 entries, with more than 400 expected in Saturday's 11am Day 1D. Here are chipcounts for some of the 74 players who just headed out on dinner break in Day 1B of the $200,000 Guarantee in the Ante Up World Championships Series. The 74 remaining players in Day 1B of the $200,000 guarantee have headed off on a 45-minute dinner break. We'll have updated chipcounts for some of those players in a few minutes. Add Jake Rosenstiel, Brian Mintz and Jeff Lennon to the late arrivals in Day 1C, the board showing 97 entries as level 3 approaches. Event 6, the $425 with a $200,000 guarantee has now crossed the 500-entry barrier and the guarantee is almost covered, with the big-entry-field coming Saturday at 11am for Day 1D, where there were more than 400 entries last January. Cards are in the air for Day 1C of the $425 with a $200,000 guarantee, 70 players seated as play kicks off. Over in Day 1B, blinds have jumped to 500/1000 with a 100 ante. The 100 or so Day 1B players have two more levels until their 45-minute dinner break. 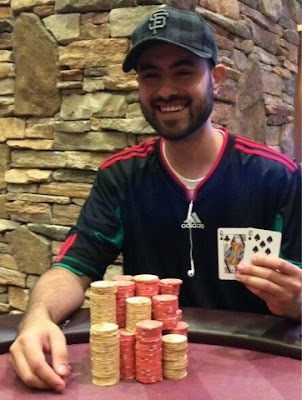 In case you missed it yesterday, you really need to go back and check out the Adventures of Ken Jorgensen last night, from a single 100-chip behind to 6-figures at one point ... quite a run, and we documented it as he went along. We are 20 minutes away from Day 1C of the $200,000 Guaranteed $425, as Day 1B gets ready to move in to Level 10 with about 120 or so players remaining. Players in Day 1B are breaking into the main poker room area as their tables break, while the tournament floor is being used to start Day 1C. There are 120 players left, but they all appear to be chasing the defending champ, Kathy Stahl, well, at least based on what we se via Twitter ..
Players get a 15-minute break after this level, and a 45-minute dinner break after Level 11, about 5pm. Blinds have moved to 300/600 with a 75 ante now. Here are updated chipcounts from across the room in today's Day 1B of the $425 with a $200,000 guarantee in the Ante Up World Championships Series. With 215 entries in Day 1B, 22 of the players are going to bag-n-tag and advance to Sunday's 11am start Day 2. Players who finish in 23rd-26th place tonight are going to cash for $700 but not advance to Sunday. 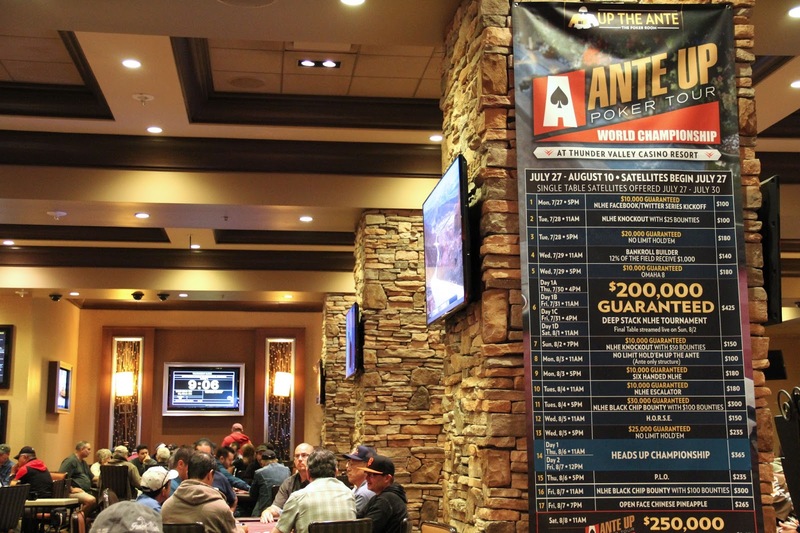 The third starting flight for Event 6 - the $425 with a $200,000 Guarantee in the @anteupmagazine World Championship Series - kicks off today at 4pm. Players start with 15000 chips, play 30-minute levels up to level 14, then move to 40-minute levels for the rest of the tournament. Late registration goes until 6:15pm, and there is a 45-minute dinner break at 8:15pm. A total of 391 entries have been recorded after the first two flights, and the final flight goes at 11am Saturday, where some 400 more entries are anticipated. Kyle @KyleK_Poker Kitagawa and Sean @DaBabyDrake Drake mix it up in a hand here in Level 6 and the chips are flying. Chop 'er up, lets move on, nothing to see here, folks. Who Already Made Day 2? Here are the 18 players who advanced last night from Day 1A to Sunday's 11am start Day 2 in the $200,000 Guaranteed. Registration is closed for the @anteupmagazine World Championships Series $425 with a $200k Guarantee and the board shows 215 total entries. Combined with the 176 from Day 1A yesterday and the total field is now at 391, with two more flights to come. Based on entries from the January $425, there is a good chance the total field for this is going to be right at 1,000 entries. There are 42 more entries so far after two flights than the record-setting field of 929 entries back in January. Day 1C had 173 entries and Day 1D had 407 in January, so there's the target for players to hit for a 1,000-entry field and a prize pool of more than $375,000. The first 4 levels are done, board showing 202 entries, and there's 15 minutes left for late registration into Day 1B of the $200,000 guarantee. Here's what some of the players in today's Day 1B are saying via Twitter about the $200,000 guaranteed $425. Wearing his best Whitesnake t-shirt, Ante Up Magazine publisher Scott Long is seated in today's Day 1B of his poker tour's World Championship Series $425 with a $200,000 Guarantee. Scott won his way in via a $100 multi-table satellite the day before. We expected to see Scott playing a week from today in the OFC tourney and perhaps in Thursday's PLO .. but Hold'em? Good luck, Scott. Here are some of the players in today's Day 1B of the @anteupmagazine World Championships $425 with a $200,000 Guarantee. Up to 166 entries in the $200k guaranteed and the late areivals keep pouring in. Anong the latest batch to arrive is Shawn Roberts, Matt Boddorf, Amber Chatwin, Brian Mintz, Rafe Craft, Kelly Douglas and Tim Klemin. One Level down and 40 players have been added to the field, we're at 147 total entries and late registration runs until level 5 starts, about 1:15 pm. Among the late arrivals is Dana Muse, we're off to see who else jsut showed up. Who is Here So Far? We took a walk through the room as cards went in the air and saw many of the Thunder Valley tournament faithful ready to take this down. 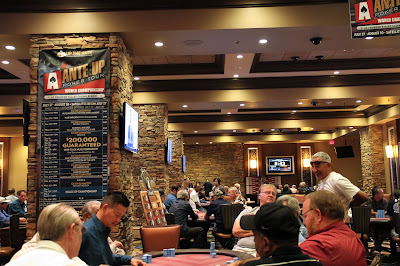 With 107 players in their seats to start, cards are in the air for Day 1B of Event 6 - the $425 buyin with a $200,000 guarantee in the Ante Up World Championships Series. There were 176 total entries for Day 1A last night, plus there's a 4pm Day 1C flight today, and $100 multi-table satellites today at 1pm and 8pm. Day 1D is at 11am Saturday, and everyone who makes Day 2 comes back at 11am Sunday to play it down to a winner. Today in the poker room, it is ALL about the $425 buyin Event 6, the $200,000 Guarantee in the Ante Up World Championships Series. At 11am is Day 1B of the tournament, players starting with 15,000 chips, playing 30-minute levels until Level 14 when they switch to 40-minute blinds. The top 10 percent of the field moves on to Sunday's 11am Day 2 start. At 4pm we do it all over again, this time as Day 1C, same blinds, breaks and bag-n-tags. But wait, if you don't want to pay $425 to get in, you have $100 multi-table satellites at 1pm and 8pm. Any time there's 10 on the signup list for a $100 single-table, that'll launch too. Day 1D goes at 11am Saturday, and we're calling our shot here folks, 415 entries at least for Saturday. Here are the 18 players who have advanced from tonight's Day 1A of Event 6 - the $200,000 Guarantee in the Ante Up World Championships Series - returning at 11 am Sunday to join players from Days 1B, C and D to play down to a winner. 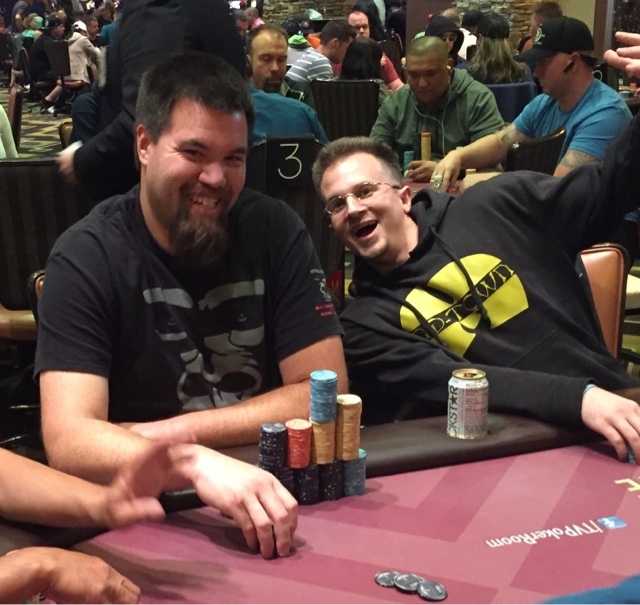 These four players cashed in tonight's Day 1A of the $200,000 Guaranteed Event 6 in the Ante Up World Championships Series, but did not advance to Sunday's Day 2. Each of the players earned $700. We missed the hand that sent Arish Nat out in 19th and his chips to Dee Timmons, but we're done for the night and will have full chipcounts for the final 18 in about 20 minutes. Ken Korgensen truly was down to a chip and a chair a few hours ago, in for the ante and a single 100 chip behind. Octuple-up, triple-up and triple-up moved him from 500 to 46,000 chips, and he is not done. All in with 66 against the AK of John Mercer and guess what? Ken has him covered. Yep, that's a 6 on the flop, it is all over, Mercer is out in 21st place, we are two eliminations from the end of the night ... and Ken Jorgensen has 127,000 chips. With blinds at 3000/6000 and 500 antes, Ken Jorgensen leads out for 13,000. Dee Timmons makes it 53,000 and Michael Marsh calls. Jorgensen gets out of the way, then bolts up from his chair in anguish when he sees the 3-9-A flop (he comes over to us to say he folded 99). Timmons checks and Marsh checks behind. The Jc turn card brings Timmons out, sliding a stack of red 5k chips on front of her. Marsh grimaces, shows QQ, and folds. Timmons shows KK. 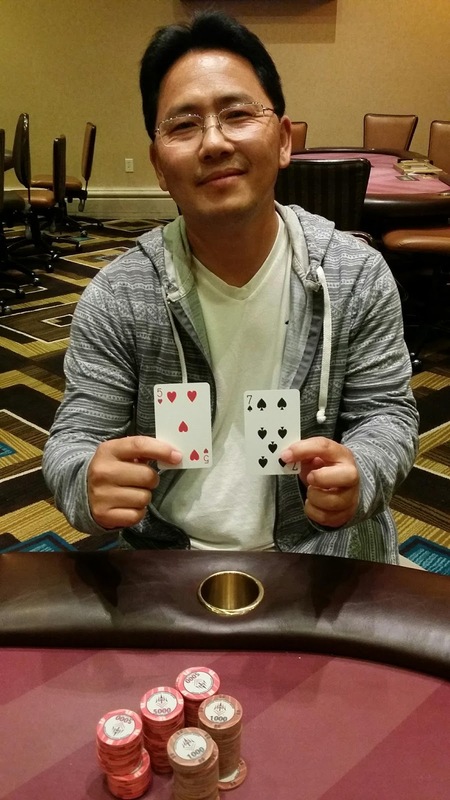 On the wrong end of hand after hand tonight against Rocky McNutt, the money bubble burst as Thai Nguyen runs onto McNutt's floped top-two. McNutt is chipleader at about 350,000, with Darrel Dier using some bubble-abuse to move to 290,000. The next 4 eliminations all receive $600. The remaining 18 players bag-n-tag, returning at 11am Sunday for Day 2. The flop is T-6-3, all hearts. Gasps all around when the Kd hits on the turn. The Jc closes it out. Oh, by the way, Dee picked up AA the very next hand and everyone folded preflop to her raise. UFC welterweight Martin Kampmann lost most of his stack the hand before AQ<AK, finding himself down to 3BB. He moves those 12,000 chips in and it folds around to the blinds. Michael Marsh raises from the SB and the BB shoves, with Marsh snap-calling. Marsh has both players covered, and scores a double-knockout when the board runs out T-T-4-J-4, taking us to 25 players, three from the money and 7 from the end of the night. 30 minutes left in level 16 and we're down to 3 tables in Day 1A of Event 6, the $425 buyin $200,000 guaranteed. Rocky McMatt, with 287,000 is your chipleader. 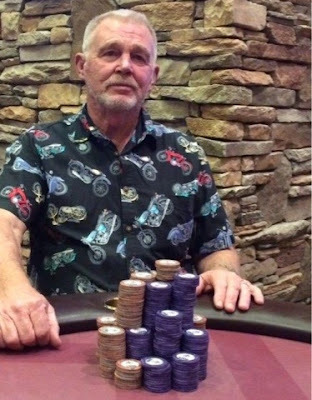 He Did it, Again, and Again and ..
We left you on break with Ken Jorgensen down to an ante and a single 100 chip behind after losing boat-over-boat in a 249,000-chip pot. Come on, boys and girls, let's play VultureCam and see if Ken can get back to a full blind. From UTG, Ken is all in and he gets his neighbor as a caller. Ken shows QJ and is in a race against AT. That's a Queen in the window ... 7-2-3-K and Ken, going in to the BB next hand, now has enough for the blind, the ante, and one whole blue 500-chip behind. Here we go, one more hand for Ken, and from the BB he is all-in-blind against one player. Ken has TexasDolly in his corner, showing T2 against 66. A-5-8-9-Ten on the river ... he did it again and now is up to 12,500, and he has enough chips to fold a few hands. Wait, here he goes again, all in for 10,000 to a raise of 8,500 ... and there's 3 total callers. The flop is 4-2-5 and the initial raiser moves all-in, everyone else folds and she turns over KK, with Ken showing AJ. No suspense here, that's the Ace of Spades on the turn, an 8 on the river. Ken Jorgensen, from a single 500-chip with antes at 400, is now up to 46,500. He definitely liked the TT2 flop (we're psychic LiveUpdates folks, we knew he was holding KT) and the 2 turn sure didn't upset him either. He was also pretty happy when Rocky McNutt moved all in on the river when a J showed up. Jorgensen was NOT happy, though, to see McNutt turn over JJ for a rivered boat-over-boat. 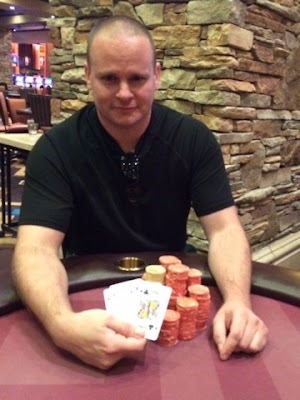 McNatt moves to 249,000 chops and a big tournament chiplead. Jorgensen heads to the break with just 600 chips, then loses the black 100 in the color-up race-off so he returns to blinds of 1200/2400 and 400 ante with an ante-and-a-chip ..
but wait , come back after break to see what happens to him ..
We show up to see a BIG pile of chips already in the middle, not a card to be seen, and the last 31,800 of Rocky McNatt's chips pushed out in front of him, waiting on Thai Nguyen to see if he is going to make the call for about 30 percent of his remaining stack. With his RunItUp hoodie pulled up high, Nguyen thinks for a bit, and begrudgingly slides a 31.8k stack out in front to make the call. The board runs out 2-Q-3-T-9 and McNatt doubles through Nguyen. Jeff Resch leads out from UTG and the player to his immediate left shoves all-in. The players fold back around to Resch, who insta-calls and shows AQ, while his opponent holds both cards in his hand, shows Resch a K and then very slowly and deliberately lays the cards down before sliding an A out from under the K.
Slowrolls never pay, as the flop comes out QJx. The 9 turn and 3 river don't help MrSlowroll either and Resch eliminates the player. Skydiving enthusiast @DarrelDier leads out for 16,700 on a flop of J♥2♣7♦ and is called by Event 2 winner Luke Williams. Williams checks dark and sees the A♦ land on the turn. Dier counts out another bet of 16,700 and Williams dejectedly mucks his cards. Shannon Kahahane - with about 103,000 chips in front on him - three-bets preflop and sees a shortstack move all in for about 19,000. Kahahane insta-calls. The flop comes out A9T and draws an exasperated sigh from the player in the 5 seat who folded AT to the 3-bet. His frustration is short-lived, however, when a K hits the turn, and a 6 completes the board, eliminating the shortstacked player. The 47 remaining players in Day 1A - including the likes of Darrel Dier, Thai Nguyen, Mike Postle, Martin Kampmann and Dee Timmons, have headed off on a 10-minute break. Players return to blinds of 800/1600 with a 200 ante. Both Timmons and Nguyen have cracked the 100,000 barrier. Dier just walked by on break to say he is at about 57,000. Play continues tonight until there are 18 players left. Those 18 bag-n-tag to come back at 11am Sunday for Day 2, including a LiveStream of the final table. Players finishing 19th-22nd tonight cash for $700 but do not move on to Day 2. Old poker folklore has it that players who headed out on dinner break for a big heavy meal often came back making poor, impulsive decisions and headed to the rail in great numbers withon 20-40 minutes after returning from break. Whether you believe the tale, the field here was reduced by 25 percent on the 30-minute level following dinner break. A bunch of shortstacks busting and bad-beat exits ... or did they fall victim to too many calories on dinner? 99 Players went to dinner, 99 came back to play down to the 18 who advance to Sunday's 11am start on Day 2. 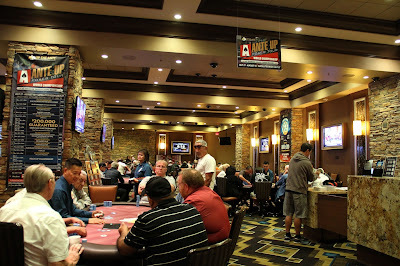 Players finishing tonight in 19th-22nd place all cash for $700 but do not bag-n-tag to advance to Sunday. 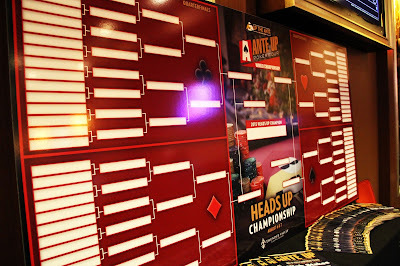 One week from today is the $365 Heads Up Championships, limited to 64 entries, with registration open now, 24/7, at the main casino cashier's cage ... so come on down, put your money down, and lock in your seat in one of the most enjoyable events on the Ante Up World Championship Series schedule. The two-day event kicks off at 11am Thursday, with Day 2 at noon Friday. Here is the structure sheet for the heads up, and all the series events. The players in Event 6 have headed off on a 45-minute dinner break. Here are official chipcounts for some of the players enjoying High Steaks Steakhouse or Red Lantern. Mike Postle and Thai Nguyen have been taking shots at each other's chipstacks for a while now, Nguyen moving ahead of Postle by about 10,000 chips. As we show up, Postle bets out 2300 from the cutoff on a 2♠K♥8♠ flop and Nguyen calls from the button. Both players check the 9♠ and after a short time thinking about the K♦, Postle raps the table with his knuckles and Nguyen does the same. "Nine," says Postle, Nguyen shakes his head and mucks. Could This Hit 1,000 Entries? 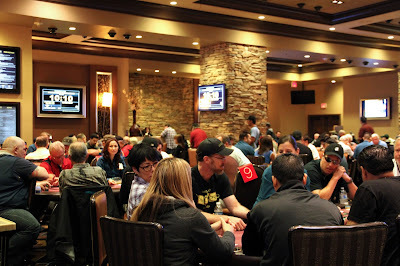 Event 6 - the $200,000 Guaranteed $425 - drew a record crowd of 929 entries when this was held in January and had a total prize pool of more than $340,000. Today's Day1A field is 39 entries higher than the record-setting tourney's Day 1, so could 1,000 total be a possibility? Here's what the record-field numbers looked like. Today's Day 1A is already larger than 2 of the 4 starting flights from last January's record-setting field ... Tune in tomorrow and see the numbers grow. A great turnout for the opening flight of Event 6 - the $200,000 Guaranteed $425, as the board shows 176 total entries. Play continues tonight until we are down to 18 players, with players in 19th-22nd place cashing for $700 tonight but not advancing to Sunday's Day 2. 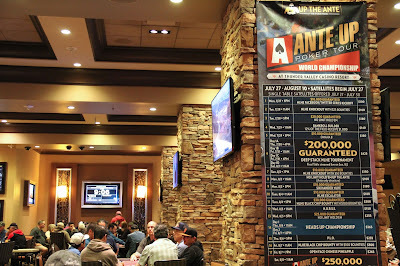 Level 4 - 100/200/25amte has started, 157 entries so far in Day 1A of Event 6 - $425 buyin/$200,000 guaranteed. Late registration is open through this 30-minute level and the 15-minute break. Darrel Dier, Amber Chatwin, Rob Grossglauser and Erik Watkins are among those arriving during Level 3. Players are still heading up to the registration line as the board shows 145 entries and 75 minutes left in late registration for Event 6, the $425 with a $200,000 guarantee. Among the late arrivals are Sean Drake, Richard Gonzales and Mike Postle. Add re-entries from Ken Jorgensen and Brian Mintz into that mix as well. Here are some of the players in the field for Day 1A of the $425 buyin Event 6 - a $200,000 guarantee - in the Ante Up World Championships Series. Cards are in the air for Day 1A of the $200,000 guarantee and there are 92 players seated with a few queued up at the registration desk ready to take their seats as well. Players are starting with 15,000 chips and playing 30-minute levels through Level 14, when play jumps to 40-minute levels. 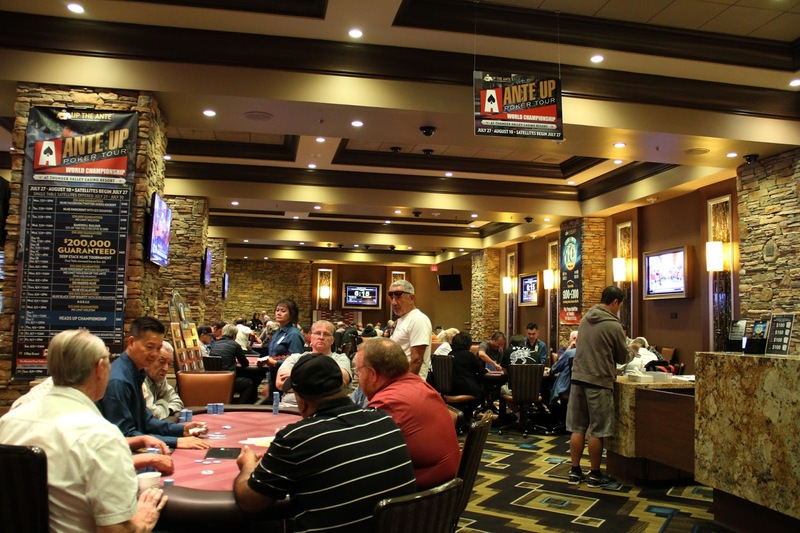 Late registration ends when cards go in the air to start Level 5, about 6:15 pm tonight. Play ends for the night when down to 10 percent of the starting field, with 12 percent of the day's starting field being in the money. Bag-n-tag tonight or any of the four Day 1's and come back on Sunday to play it out to a winner. The event's final table is going to be LiveStreamed with Ben Erwin - Director of Poker Operations and Dan Ross of HoldemRadio.com. You can watch the LiveStream right here on the poker room blog. Here are the results for the first 5 events in the @anteupmagazine World Championships series. 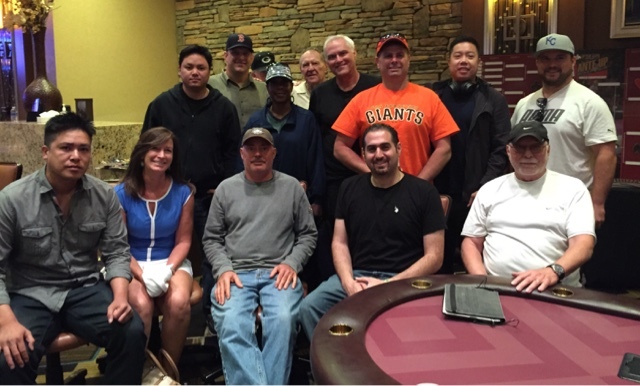 Today's 2 satellites into Event 6 - the $425 buyin/$200,000 guarantee - produced 14 seat winners and 105 total entries. Day 1A of the $200k kicks off here in just more than an hour - at 4pm - featuring 15,000-chip stacks, 30-minute levels through the first 14 levels and late registration open until 6:15 pm (the start of Level 5). All players who bag-n-tag on one of the Day 1's come back Sunday to play it down to a winner, with the entire final table being LiveStreamed. The last time this event was held, Kathy Stahl took it down for a whopping $62,000 first-place prize. Play today's 11am or 1pm satellites to win your way in to our $200,000 guaranteed $425 Event 6 of the Ante Up World Championship series. The 11am $55 satellite awards a $200k GTD seat to 1-in-10 players, while thr 1pm $100 satellite gives a $200k GTD seat to 1-in-5 players. You can also go ahead and buy in direct to Day 1A for $425 with cards in the air at 4pm. Day 1D is 11am Saturday. Bag chips in any flight and come back Sunday for Day 2, with the final table being LiveStreamed. Registration is currently open for 5pm Omaha 8 or Better! $180 BUY-IN. $10,0000 GUARANTEED PRIZE POOL. Approaching 100 entries! We currently have 97 entries. Registration open until 12:35pm.